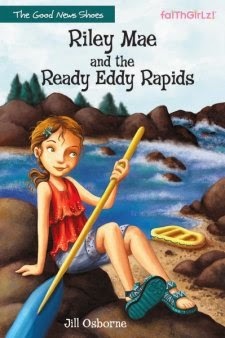 Riley learns that life is unpredictable as she goes on an adventure with her friends and family in book 2 of the Good News Shoes series: "Riley Mae and the Ready Eddy Rapids" by Jill Osborne. Aimed at pre-teens -- this adventure novel is a great mix of humour and spiritual morals. Riley Mae is the 12 year old spokesperson for a line of shoes. To promote the new Riley Mae river sandals, Riley heads to Montana for a photo shoot and there the adventure begins -- or rather -- continues. Sometimes you can pick up a book 2 in a series and figure out where you are, but this is a time when I wish I had realized this was book 2 and read book 1 first since there were references to the first adventure throughout this novel. What this book needs is a great big "2" in the upper corner! "God cares more about what we give than what we have." Some points worth mentioning are the mature themes that are referred to. Murder and death threats are both mentioned as well as a child who is abandoned by her mother. Riley's friend, Sunday, has leukemia and, while that is dealt with more in depth, it is handled very positively. In fact, Sunday is a beacon of hope to everyone around him. The squeamish (like my daughter) should know that there are references to needles a couple of times and references to an injury as "hamburger". I like that Riley at one point flips open the Bible to a random page hoping for the answer to her question and she discovers that that doesn't work for her. Some Christian books have all the answers readily available for the characters and I like that this novel is more true to life. Sometimes you don't have the answers you hope for right away, but you can still trust that God is with you and is orchestrating things for your good. While there is some talk of a crush between two adults, Riley's interest in a boy back home is simple and innocent. Riley isn't gushing about boys or makeup or fashion. She doesn't try to impress anyone by acting older than she is. Riley is a girl with a growing faith who learns that she has been called to share God's Good News with those around her. She and her friends are the kinds of Christian role models you want your preteen to read about. And considering the great adventures Riley and her friends have, the Good News Shoes series are the kinds of book your preteen will want to read. OOh Cool! Is Riley Mae a series? Im really interested in these now! Amy, Riley Mae is a series -- there's even a third book coming out soon!